Cat food: Fromm, Muse, Fussie Cat, Pure Vita & more! We are Northwest Indiana’s premier locally owned retailer of quality dry cat food. We carry the industry’s best like: Fromm, Earthborn, Fussie Cat, NutriSource/Pure Vita, Muse, Orijen/Acana and much more. Our knowledgeable staff is always available to help you find the recipe that is perfect for your pet! ACANA Made from America’s best and freshest ingredients in our state-of-the-art Kentucky DogStar® kitchens, our award-winning cat foods are formulated to our Biologically Appropriate™ and Fresh Regional Ingredient standards. Loaded with authentically fresh and locally sourced ranch-raised meats, free-run poultry, nest-laid eggs and wild-caught fish, these unique and flavorful foods feature 75% meat and 25% vegetables and fruit to nourish your cat or kitten completely. Best Breed develops the healthiest all-natural pet food possible. Each ingredient must be of the highest quality and must be accretive to the overall value of the diet, meaning no animal by-products, cheap fillers, any sort of gluten (e.g., corn gluten) and artificial preservatives, flavors and colors. Our cat food recipes offer a well-balanced diet, made with the highest-quality sources of low-ash meats and fats to help ensure easier digestion and maximum nutrient absorption for your cat. All BLUE dry cat foods are made with the unique combination of the finest natural ingredients and our exclusive antioxidant-rich LifeSource Bits®. Blue Buffalo offers a variety of meat-first recipes for cats of all life stages. Earthborn takes a natural approach to cat food nutrition, offering a line of holistic cat food products for your feline friend. Wholesome, nutrient-rich vegetables and fruits, and a precise blend of essential vitamins and minerals are carefully combined to provide a highly palatable, healthy diet for your cat. Every ingredient is formulated to provide proper nutrition to every part of your cat’s system for optimal overall health and total physical well-being. Fussie Cat Market Fresh recipes are created with the freshest and finest ingredients. Recipes start with chicken, turkey, or salmon as the first ingredient because all three are extremely palatable for felines. Muse natural dry cat foods combine all the nutrition your adult cat needs with the deliciousness she wants – tempting taste even finicky cats can’t resist! Recipes are grain free, gluten free. There aren o fillers or chicken by-product meal, no corn, no wheat, no soy, and no artificial flavors, colors or preservatives. 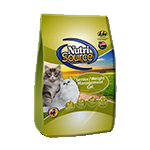 NutriSource® Cat & Kitten Food provides every nutrient your cat needs and has a great taste that cats love. Formulated with premium ingredients (with added vitamins and minerals) and the latest scientific feline nutritional information available, NutriSource® Cat & Kitten Food provides complete care for kittens and adult cats. Dogswell, the makers of Nutrisca, strives to provide safe and superior quality products to help pets live long, happy and healthy lives. They carefully choose raw materials so that only the best, purposeful ingredients are in the final product. Each of their dry cat food recipes are crafted with simple, real food ingredients. The #1 ingredient is always protein. Recipes are grain and potato free and do not contain corn, wheat, soy, artificial colors, flavors and preservatives. Orijen’s award-winning dry cat food is formulated to be biologically appropriate. Cats are hunters and, just like their wild cousins, their teeth, jaws and digestive system are all adapted for meat concentrated diets that are rich in fresh meats and meat diversity. Orijen’s Biologically Appropriate™ cat foods mirror the natural feline diet. To help your cat thrive, Pro Plan foods are created with both extraordinary nutrition and outstanding taste so your cat’s full potential can shine through.